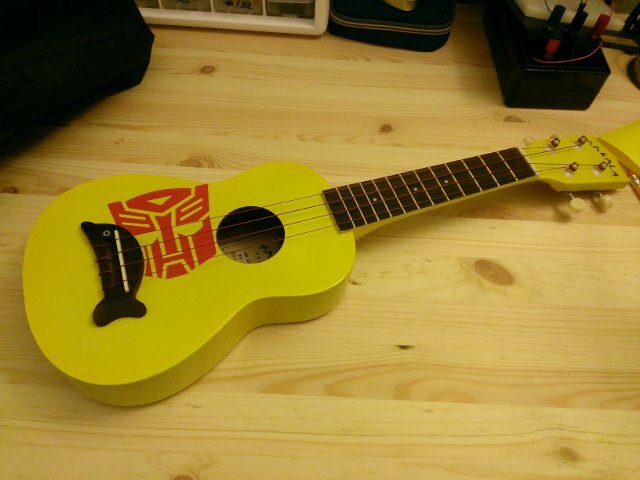 Autobots, transform and uke out! For a while now, I’ve wanted to make a “custom” ukulele, ie. 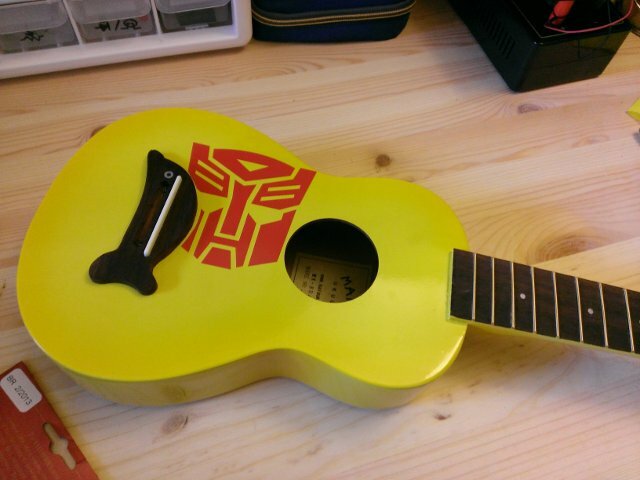 take a cheap ukulele and mod it into something original. At first I’d wanted to take a green Fluke ukulele, slap on an Xbox logo and replace the buttons with ones colored like the buttons on Xbox controllers. Unfortunately, when I finally picked up a Fluke I wasn’t impressed at all with the instrument, and the plan quickly fizzled. Then a few weeks ago I got an email about a local shop getting a new stock of Makala Dolphins, which, if you don’t know, are cheap, sturdy ukes that come in a variety of fun colors and with the right strings, can produce a pleasantly surprising sound. So I headed on down to the shop, to see if anything struck my fancy. 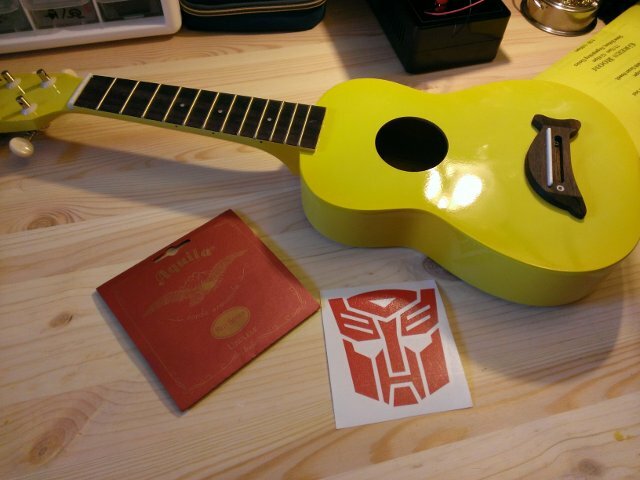 Then it hit me: all I needed was a red Autobot emblem, and I’d have my very own Bumblebee Ukulele! So I bought all the parts and set aside an afternoon to put it together. Let’s walk through the… transformation. So, first we start with the yellow Makala Dolphin. Next we take off the strings. Now we get all the pieces together. I bought the smallest Autobot emblem I could find, but of course it was still too big. I tried removing the signature dolphin bridge, but I decided, why hide this uke’s heritage? So I traced the body of the uke on a sheet of paper, taped the emblem to the sheet, and cut out where the emblem and the bridge overlapped. It worked perfectly! Time to string up those lovely new red strings. Voila! 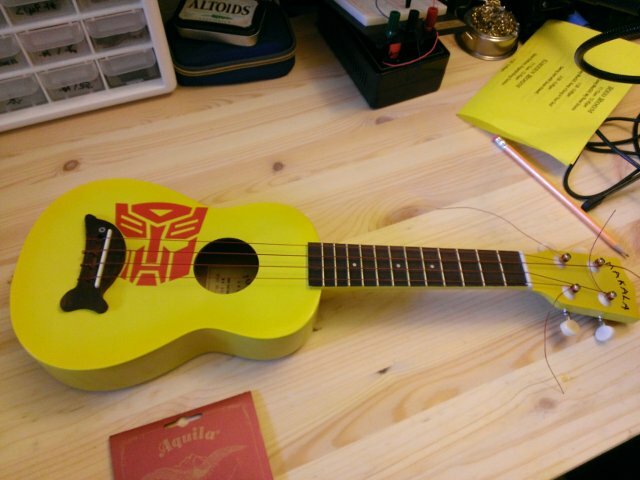 Snip off the excess string, and we have the Bumblebee Ukulele! The strings still need a little stretching, but otherwise the uke looks and sounds pretty good. Once the strings have settled I’ll be sure to record a video of it in action. But for now, it’s on display in my office at work. I bought three new ukuleles when I took Anne to Hawai’i, bringing my collection up to five. (If you haven’t yet, read those stories in Parts I, II, and III.) So what happened after Hawai’i? It wasn’t hard to maintain the enthusiasm I’d built up over the vacation. I’d bought a bunch of new strings, and went straight into restringing my old instruments. Then the first order of business was choosing a “primary” ukulele, one I intended to use most of the time. That, along with stretching all the new strings, kept me busy early on, trying to get my strumming back into shape, as I played around with the books I’d bought, along with my old material from the Royal Hawaiian Ukulele Band. The best book I picked up was Barry Maz’s The Complete What Ukulele Players Want To Know. So much useful information, but the biggest help was the chapter on finger exercises. See, my fingers were killing me, especially on the smaller soprano ukuleles, and with weak fingers came bad picking, bad chording- just a bad sound all over. But as I stuck with my Kala tenor, and did the exercises, after two or three weeks I started seeing real improvements in my ability to work the fretboard without killing my hands. The next break came when I found a tutor in my local area, Dave from Pacific Music. I still hadn’t found a book that I liked, and knew I needed some structure and accountability if I was going to make this thing work. Dave’s been a great resource, helping me get my sight-reading into shape, as well as exposing me to a ton of easy to play songs, (and yes, skipping Mary). He got me using Lil Rev’s Hal Leonard Ukulele Method Book 1, which together with Jumpin Jim’s The Daily Ukulele, I have both a path to follow and a lot of material to keep me interested. As I got better though, I still felt like the tenor was a bit too much for my hands, and I found myself accepting the pain of playing a soprano, just because the sound and size felt truer to me. I want to play ukulele, not mini-guitar. I started seriously looking at getting the medium-sized concert uke, but I just couldn’t find the variety offline here on the mainland. That is, until I got to visit a music shop in California, while visiting family. There I tested a Kala concert, and I was sold on the size almost immediately. It was the best of both worlds for me; only I wasn’t looking to get yet another Kala. I figured I’d want something cheaper, so that if I didn’t like the size after all (every uke feels great in the store when you want a new one), I wouldn’t feel bad about spending the money. I waited and looked online, and after much consideration and advice from others looking at beginner concert ukes, ordered a Makala MK-C from HMS, with Aquila strings (Yes, I recognize that Makalas are made by Kala). Turns out size really did matter. It was big enough that I could hold it upright and not worry about it tipping over while I moved up and down the fretboard. It was small enough that I could play it standing up without needing a strap. I had enough room for my fingers without having to overstretch my hands. I could keep my arms in a more neutral position at my sides; not elbows scrunched in like on the sopranos. It immediately became my primary instrument. I played it for a couple months, on through the holidays, having a blast the entire time. Since it was among my cheapest ukes, I wasn’t afraid of it. I could wail on it, really get into it, without having to baby it. That made me bolder on all of my instruments, so I had more fun playing those too. But it wasn’t long before the itch for another ukulele came back. I’d found my size, but I didn’t plan on playing the Makala for the rest of my life. I’d been given a taste of Hawai’i-made ukes, now I just needed a justification for getting one. See, I’d told myself that I wouldn’t buy a really expensive uke until I was good enough to feel like I’d earned the right to play it. I didn’t want to drop some major cash, only to let the hobby fizzle out again, and leave me with even more expensive decorations. I hemmed and I hawed for weeks, before finally giving in. Playing ukes makes me happy. It’s a great stress reliever. My New Year’s resolution was to reduce stress, and I’ve already got a busy year ahead of me. So I started shopping again. I knew what I wanted. I wanted a K-Brand, solid Koa from Hawai’i. I wanted a concert-sized. 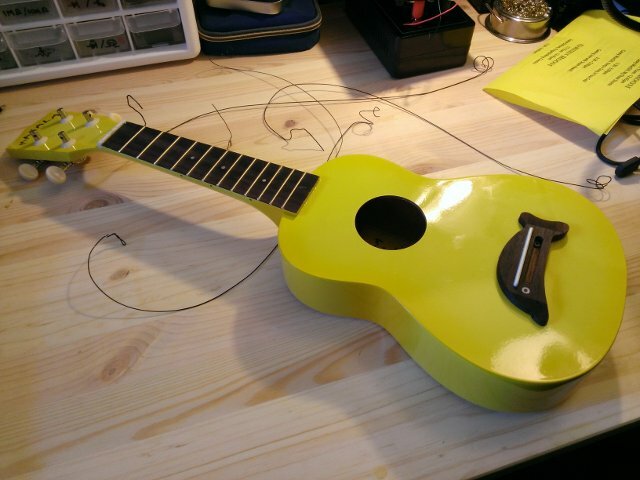 And I wanted it to look traditional, like an ukulele, not a guitar, not completely blinged out. I went back and forth on several models before finally landing on a KoAloha KCM-00. I ordered it from HMS and obsessively watched the tracking number. It’s solid Hawaiian Koa. Stylistically it’s plain, but beautiful in its plainness. I love the look of raw wood, and thankfully the gloss coat isn’t obnoxious. It’s my first and only uke with friction tuners. I’d steered away from them before, but I wasn’t intimidated anymore, and I wanted something light and easy to handle. I was happy I did, trust me, this uke floats like a feather-weight boxer. The orange buttons are nice too. It’s proudly traditional and someday it’ll probably become a family heirloom. I don’t need a pickup, but I figured, if I ever did want one, now was the time to get it installed, so I got a MiSi Acoustic Trio. It’s quite amazing- no ugly controls, no tough-to-replace battery. It runs off of an easy to charge capacitor, and it’s so light you’d never know it was in there. Oh right, the sound! I can’t describe it. It’s simply amazing. It’s been my primary uke ever since it arrived. Don’t get me wrong, I still take out all of my ukes at least once or twice a month, to test how much better I’ve gotten at playing. And I am getting better. I bought some basic recording equipment and ever since the Makala I’ve started posting videos on YouTube of my progress. I’m enjoying building up both my repertoire, and my techniques. I’ve got more books, am subscribed to all the best ukulele blogs, still go to classes with Dave, and even got a chance to attend a couple of Lil’ Rev’s workshops. I practice almost every day, sometimes with a set structure, sometimes just experimenting with stuff I’ve read online. I love every minute of it. I’ve gotten over those first major humps, and though there’s still a long road ahead of me, I’m really enjoying the trip. Okay enough writing, time to get back strumming! P.S. There’s no Part V post planned, but rest assured I’m sticking with it this time. P.P.S. I even learned The Inner Light! Honestly, when I sat down to write about my history with the ukulele, I wasn’t imaging a series. It’s just that I hate huge blocks of text. I like my stories bite-sized. So if you haven’t yet, I highly recommend reading Part I and Part II first before continuing on. Let me set the stage: it’s 2012 (yes, finally, for real this time). Girlfriend Anne and I have moved in together. My ukuleles are in the closet in their cases. We’ve planned a vacation to Hawai’i for the Fall, between our birthdays. Ten nights on Oahu, my first real vacation since college, her first time in the islands. Right at the beginning of the trip, we go the Aloha Stadium Swap Meet. I mean it mostly as an exercise to pick up a few trinkets, and to ground Anne in the “real pricing” of things in Hawai’i, keep us from wasting money in the touristy shops if we doesn’t have to. While I’m walking around, I see a stand with ukuleles. So I stroll over, curious to see what I remember. I see an uke on display with a sale sign. It’s a slim-body, zebra wood tenor. I pick it up, and it doesn’t sound half-bad. It’s easy to hold, easier even than the more expensive Kala I have back at home in my closet. I fiddle with it, and it starts coming back to me. The only song I’d really dedicated myself to leaning in college, a finger-picking intro for September in the Rain. I have no references with me but my own memory. So I start picking. I keep making mistakes, but every time I start over I get a little bit farther, and my grin gets a little bit brighter. I ask Anne if I should get it. We’re living together after all. If me practicing is going to bother her, than I might as well put this back on the rack and keep on walking. For the millionth time I’m reminded why I love this woman. She tells me to go for it. She’s been listening to me play, and despite all the mistakes and backtracking, despite all the evidence that I have a long way to go, she tells me she’d love to have that atmosphere around that apartment. So I buy it, even getting a cheaper price and a free tuner because their credit card scanner breaks down during my transaction, and I have to go run to an ATM to get cash. I take the uke back to the hotel, meaning to take it along with us a we travel around the island. I strum a little in the hotel room, but otherwise the bug is only nibbling. It’s a nervous new energy- am I going to really pick this up again? Am I going to stick with it this time? During the week I pick up a some books from a local music store, and a bunch of CDs of ukulele music for us to listen to in the rental car. And I plunk around with that intro to September in the Rain during those the slow moments on the beach. The next weekend we’re back at the Swap Meet. Now that we’ve been around the island a bit, Anne’s ready to buy some gifts and stuff for the apartment. I mention that I’d always wanted a pineapple shaped ukulele, and that if we happen to see one, I might pick one up. This time I find a different ukulele stall, one with some seriously gorgeous instruments. I can see right away the bump in quality over the stall I visited last time, and the owner confirms it when he starts teaching me how to shop for ukuleles. I find out that the zebra wood I bought a week ago is a laminate, and though it’s still a fine instrument, the wood layers will probably split and make it sound awful in thirty years. But the way I see it, it was the right price, the right sound, and it got me back in the game. Anyways, as I’m talking to him, I spot a pretty little pineapple uke hanging on his wall, and he lets me take it for a spin. It’s solid acacia, trimmed in mother of pearl, and has gold tuners. The sound is sweet and mellow, and I know I simply have to have it. After I’ve made my purchase, he takes down a $3000 Kanile’a, and lets me play that for a second. My brain almost melts at how awesome it sounds, even in my beginner hands. Out of my price range, but he gives me a brochure, which I slaver over for the rest of the day. So fast forward to the final few days of our trip, and so we’re heading up to North Shore to watch the surfers. On the way, I see a sign for an ukulele store, and I convince Anne to pull over for lunch at the taco place next door. Then of course, we pop in to see the ukes. It’s an ukulele-lover’s dream shop! Walls and walls of beautiful ukes. And ss I get to talking to the guy working the counter, and I see a few HMS logos, I start putting two and two together and see that hey, I’ve stumbled upon the Hawaiian Music Supply’s home store! These are the guys my grandmother bought my first uke from, back when they were selling ukes out of the back of a van. I try out a bunch of ukes, and Anne just kind of nods and smiles as I regurgitate everything I’ve learned about ukes from reading online on my phone during our downtimes in the hotel. 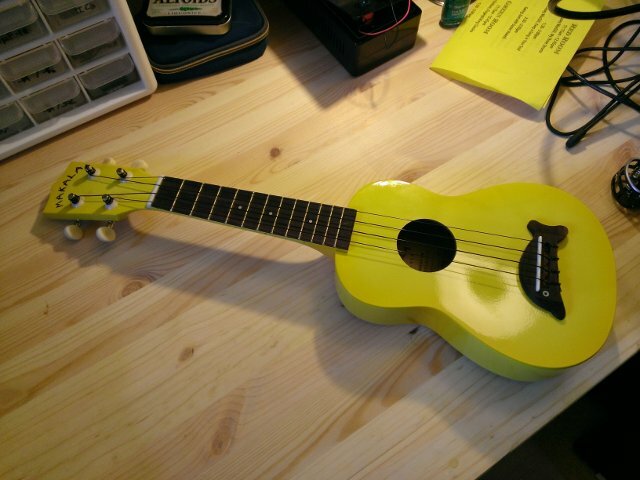 I finally decide I need just one more ukulele, this time a Kala Travel Soprano. I’ve only been gawking at them all week on my phone. I get the action lowered so I can play it easier, and in a bit of logistics, have them pack and ship me the zebra tenor I bought at the beginning of the week, so Anne and I only have the two smallest ukuleles to get on the plane. We spend that very afternoon on the beach, watching the surf come in, and now with my two newest ukes, I teach her the beginning of the intro I’ve been practicing all week. On our way back home we get caught in the whole Alaska Airlines’ network crash, and so we’re stuck in the terminal for hours. But there I am, happy as a flea (on a pile of dogs, you see) strumming away on my new ukuleles. The bug’s bit me hard this time. But wait, the story’s just getting started. Do I stick with it post-vacation? Stay tuned and find out! Update (06-APR-2013): Continue reading with Part IV!